Its quite a different and tasty south indian vegetable curry. Vegetables are mildly steamed and sauted with spiced lentils. Goes great with spicy rice dishes. I stick with my Moms recipe of using two kind of Dals. Some use three/four kinds too. Wash well and soak the dals in water for couple of hours (minimum 1 hr). 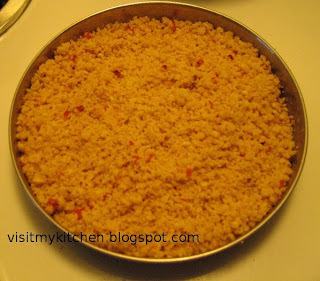 Drain water and Grind it coarse in mixie along with Red chilli,Hing. Sprinkle with few spoons of water steam it for one whistle. Once cooked, drizzle some oil in hand and sieve the paruppusili into breadcrumb consistency (OR) give one more blend in mixie. This could be stored in air tight boxes for a week. Steam the vegetable of your choice, for one whistle. In 2 spoons of oil, saute the paruppusili for couple of minutes. Add the steamed vegetable, add red chilli powder , salt and cook for 5-8 mins. Serve hot with rice or as a side dish. 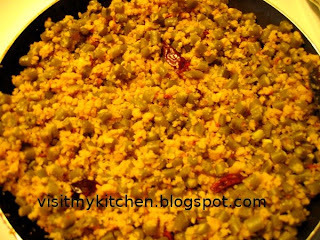 Below is pic of Beans Paruppusili..
Parppu usili Sounds very spicy.I hope you still remember that incident whenever you boil eggs?????????? My fav ..looking so good..